Septic Tanks & Sewage Plants - What's the difference? Home » Blog » Septic Tanks & Sewage Plants – What’s the difference? Septic Tanks & Sewage Plants – What’s the difference? Septic tanks and sewage treatment systems serve the same purpose to the extent that they both provide buildings, that don’t have access to mains sewers, with a way to process their wastewater. Despite their similarities, they do have some distinct differences. In this blog post, we’ll be looking at the difference in how septic tanks and sewage treatment plants treat wastewater. To understand the difference, we must first look at what septic tanks and sewage treatment plants are and how they work. 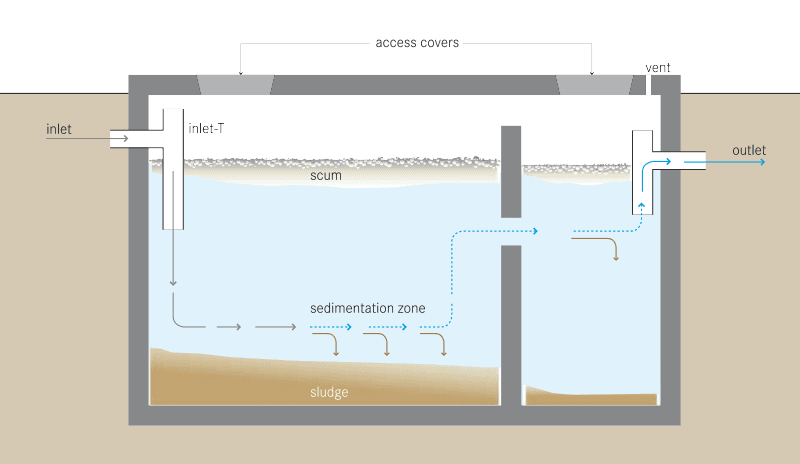 As you can see in the diagram below, septic tanks are normally buried underground and are split into multiple chambers. Wastewater enters one end of the septic tank, before being separated into solids (sludge) and oils (scum). The separated wastewater (effluent) then leaves the septic tank via an outlet and goes into a drainage field. Once the water leaves the outlet pipe and has gone into the drainage field, the effluent is percolated through the ground to remove bacteria, before being dispersed and rejoining water courses. Although sewage treatment plants perform the same function as a septic tank, it does it in a different way. Rather than just separating the sludge and scum from the wastewater, a sewage treatment plant uses a pump to aerate the chamber. This process encourages the growth of ‘good’ bacteria that will help to break down the harmful bacteria that’s in the wastewater. Once this process has been completed, the liquid water can be released from the plant directly into water courses, such as streams. It is however advised that you check Environmental Agency guidelines to ensure that your system complies and that your area isn’t subject to restrictions. In terms of the process, the key difference between a septic tank and a sewage treatment plant is that a sewage treatment plant purifies the effluent before it is released, meaning that it can be released into streams without the need for further filtering. Aside from the cleanliness of the effluent, there are also a number of other differences. For more advice and assistance with your sewage treatment, please call the team at Pumping Solutions. With years of knowledge, you can be certain that you’ll get expert advice that’s tailored to your needs.